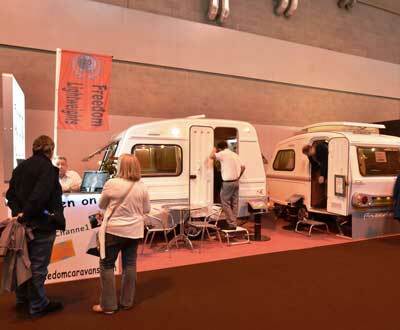 The eagerly awaited NEC Caravan and Motorhome Show this October was being viewed as a tester for the industry. With more competition in the market place with value and styling in tourers and also new motorhomes on display with choices of panel van conversions to US A class models the show had much to offer. Holiday homes were represented with the latest designs from several major manufacturers. From the opening day on the Tuesday the show was busy each day peaking at 27,000 on the Saturday. Visitors had plenty to see with new models being shown from all the major manufacturers. Bailey had the new Unicorn 2 on show plus the latest end washroom transverse fixed bed layout and the rest of the Bailey ranges including the Approach motorhomes too. Elddis had the new Affinity range and redesigned Avante’s on show while all the tourers and motorhomes now have their new SOLID construction. This new method uses new bonding adhesives and a key-lock design connection system. Elddis were keen to market the new construction at the show with samples of it on the stand while launching their new Affinity tourer range. The Affinity offers Alde heating, TV and a spec which puts it in the hotly contested upper mid market tourers. The new Avante range also was launched here while the latest Autoquest motorhomes were also on display. Swifts stand boasted holiday homes, motorhomes and tourers too with success being the new Challenger SE range light, fully specified and competitive on costs too. The Sprite range which enters 65 years for 2013 is the best selling entry level range. Sales exceeded the company’s targets with motorhomes doing particularly well along with the Escape entry level range having new layouts added. Coachman had steady sales with its re-vamped Amara range while the Laser twin axled range proved a show success. Vanmaster the luxury builders who have acquired Bentley Motorhomes also showed its new Signature range topping £40,000 for the 640 model. Adria were showing both motorhomes and tourers with a new Sports line dealer special being shown for the first time. The new models had upgraded spec to enhance the Altea based specials. These are the first specials that Adria have produced since 1994. Freedom were also showing there GRP models. Small tourers seem to have made a comeback with several micro tourers from manufacturers such as Danbury Motorhomes. 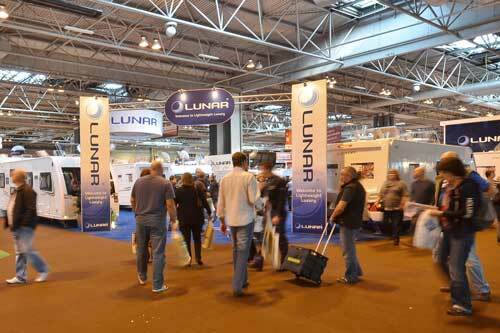 Lunar who have just given the exteriors a major update and were also giving interest free credit deals had one of their best shows ever with Lexon and Clubman’s proving very successful while Quasar with the new interior upgrade also sold well. Gobur folding caravans were as ever very prolific with there niche folders and celebrating 35 years with some special edition models. Eternity the new manufacturer based in Widnes showed all their new extending models. These new models look good from the outside and attracted many to the stand while also sales matched the interest shown. Hymer tourers made reappearance though they were not to UK spec but future models will be we were told. Airstream showed all their range including two new models while the company also had the new Tab’s on the stand, with some larger models being present. Welsh based Fifth Wheel showed its new extending model on a single axle and shorter than the twin axled version launched last year. Again sales were good over the show period with orders being picked up after the show had finished. 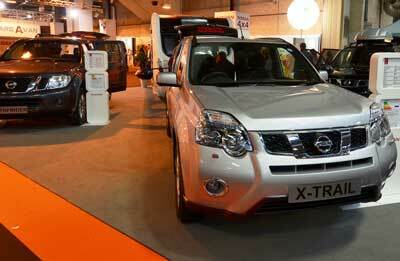 Several car makers were also present with VW, Nissan, Ssangyong and Subaru. Car manufactures are fully aware how important the tow vehicle is when choosing a tourer so the show is a good opportunity to get amongst caravanners. As with all shows the dealer special caravan and motorhome proved successful with most large dealers offering variants of Elddis, Swift and Lunar with Marquis being very prominent in this market sector. One caravan manufacturer which seems to have stopped production is the Stealth/Concordia a shame due to the diversity and much improved models shown last season. The show then was a superb success with plenty to see, US motorhomes and Fifth Wheelers being the big stuff while folding campers from Pennine and there latest folding caravan were displayed too. The good news to is the NEC February show is back after a year away – the new organisers the NCC are hoping this new look show will be a further success in 2013.